The Center of English Language was established in Dallas, Texas in 1981. Business people, U.S. residents and international students will all find this school an excellent place to learn English as a Second Language (ESL) or English as a Foreign Language (EFL). The school specializes in preparing students to take the TOEFL (Test of English as a Foreign Language) through in-depth grammar courses, but their teaching style also prepares students well for "real life" in English, through fun activities and conversation practice. 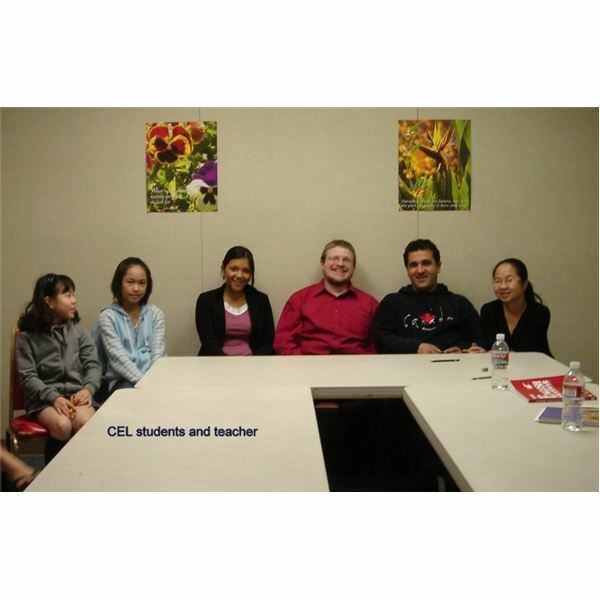 CEL welcomes students of any language background, and has a very diverse student body. Students’ ages range from the teens upward, increasing the diversity in the school. Also, the staff at CEL are eager to help students from abroad with practical logistics, like finding housing and dealing with immigration issues. Students who choose CEL will find it to have an excellent language program, and they will also feel supported by a community of students and staff who care about them personally. Center of English Language offers beginning, intermediate and advanced classes. Incoming students will be administered a test to help them determine which level is best for them. Students do not need to know any English at all to begin in the first level; they can start learning from "ground zero," with the alphabet and basic greetings. However, most students do have at least a minimal introduction to English before beginning classes at CEL. The class sizes are small, with an average teacher/student ratio of 1 teacher to 5-7 students. The study week at CEL is basically sixteen hours long: four hours every morning, Monday – Thursday. Each day’s classes are divided into two two-hour sections. There are two hours of grammar class (which covers English reading and writing skills) and two hours of conversation class (which covers English listening and speaking skills). Students will have one workbook for each class: a "Reading/Writing" workbook and a "Grammar/Conversation" book. These, along with daily homework sheets, will be given to students to take home and work on during evening hours. If students want to study more than the assigned homework, there is a public library right across the street from CEL that offers plenty of supplemental English language materials that students can check out for free, including books, DVDs, magazines and CDs. The "Grammar Class" focuses particularly on language skills employed in reading and writing. The curriculum provides interesting reading selections that the teacher and students will analyze together, and writing assignments will be based on the readings. Students get the opportunity to do creative writing in English, and then to have input from the teachers on the grammar. The "Conversation Class" focuses more on spoken communication in English–both listening and speaking. This class is an excellent place for a student to hone pronunciation skills, and to practice dialog in a semi-natural setting, both with other students and with the teachers. Both Grammar and Conversation Classes will introduce students to a broad spectrum of English language vocabulary, as well as to countless aspects of American culture. In addition to regular daytime classes, evening classes are available for students who are wish to do more intensive studies. Also, if students desire, they can request one-on-one tutoring from a teacher outside of normal class hours. This can be advantageous because even though the classes do include conversation, more "real life" conversation is needed for students to get truly fluent in English. Center of English Language has month by month sessions. With each month-long session,students can expect to gain more competence. This schedule is practical, because it allows flexibility in scheduling. For example, a student can take one month off to work and then return to classes the following month. After the first four-month session, students should be able to hold a basic conversation about everyday topics in English. You can see a list of class sessions on their website. Although tests determine which level students are recommended to join, it is completely up to the student which level he or she chooses to enroll in. CEL is not an accredited program, and the classes are not working toward any official degree. The training is for those who want to learn English for personal reasons–whether to enter a higher degree program, to excel in business, or to attain excellent communication skills in the English-speaking world. So although students will be recommended a level to enter, they are free to move at the pace they are most comfortable with. Tuition at CEL is $3,180.00 for sixteen weeks of class (four four-week sessions). Although students are in general expected to make their own housing arrangements, students who are interested in a complete immersion program (always a helpful route when trying to learn a new language quickly and well!) are welcome to participate in CEL’s homestay program. Host families will give students a private room, provide some or all meals, and of course, offer plenty of opportunities for conversation in English! The monthly cost for a homestay ranges from $350.00 – $550.00 (depending how many meals a day are included with the homestay), which is, comparably, a very reasonable price for accommodation in the Dallas area. The website can be accessed not only in English, but also in Chinese, Korean and Spanish. Overall, Center of English Language is a very good choice of a language school. They have month-long sessions, an established curriculum that leads students at a regular pace through the grammar of English, high-quality teachers that care about students, and a good infrastructure for helping students who have come from other countries. The downsides to CEL, though few, would include: not a lot of conversational opportunities outside of class (students need to find their own), and no in-school library from which students can check out English-learning materials (but there is a public library across the street). Overall, though, CEL is a great place for students to learn English as a Second/Foreign Language.